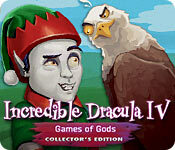 Incredible Dracula IV: Game of Gods Collector's Edition is rated 3.4 out of 5 by 47. Rated 5 out of 5 by Magda640 from Oops, did I give this game five stars? I sure did! Disclaimer: I adore this particular Dracula. He's cute, not vicious. A little mouthy, for sure, but he has compassion. (Not really for his zombie, Rufus, but apparently he pays well.) Others have complained that the artwork is not too good, but they need to realize that Loki put Drac into a board game, so the other characters are paper. I enjoy the references Drac makes to the other games in the series, but it isn't necessary to have played those. I also like all the allusions that are made to many super heroes. I want to point out that I am a grandma, but I'm not entirely oblivious to the world out there. The only problem I had with this long game is when I began to play the bonus game a timer was on the screen. I never play with a timer, because it is too mind boggling for me, so I don't know why the timer appeared. I couldn't get rid of it. Hey, the game is cute. You really should try it for yourself. Rated 5 out of 5 by beltie from Best So Far Really enjoyed this one and I have them all. Love that you can choose an option to "Queue Actions" Good replay. Strategy IS needed to attain 3 Stars on all Levels. Two levels were ridiculously hard and I had to replay more times than I can count. Others had to be played through at least once to figure out what resources were required AND in what order. You'll understand this last comment when you play some of the later levels. 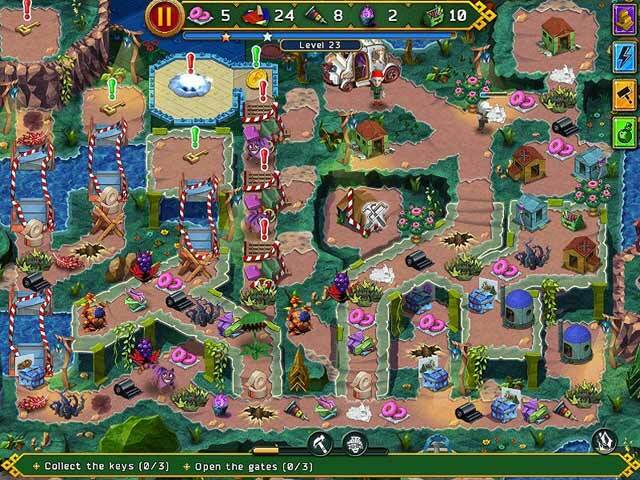 Still, it is rewarding when finally attaining 3 Stars Game play is smooth; graphics are nice. Even the storyline was entertaining The CE has a Strategy Guide as well. You can also mouse over many items prior to starting a Level, to get an idea of what is needed. This is my favorite in the Series. Am replaying the earlier ones now. Rated 5 out of 5 by Starsmark from Superheroes and Villans Everywhere Loki is up to his tricks again. He just can't help himself! This game is very different from the first three, which is great. Almost everything is new and almost everything is fun. The game board and graphics are beautiful. My only complaint is I find myself without enough resources to finish a level and it's not at all apparent that this will happen. For example, on one level, I leveled up a resource factory only to find that by doing so, I ran out of enough supplies to build the last building. I guess I need to count the resources, which is annoying. Rated 5 out of 5 by Missyvs from My favorite one Absolutely loved this game! Very challenging and fun! Rated 5 out of 5 by alilypad from Love this series Great series. Love to play on casual, but timed is also great! Rated 5 out of 5 by Jpatricia from Loved it Initially I thought this game looked awful however I thought I would press on with it and am sooo pleased I did. Wonderful. So if you have read the unflattering reviews be brave and give it a go. I think you will be pleased you did. Rated 5 out of 5 by WheeFunFun from Fun & lighthearted with fresh details My first review, doing just so I can raise the unfairly low number of stars and encourage others to try it. 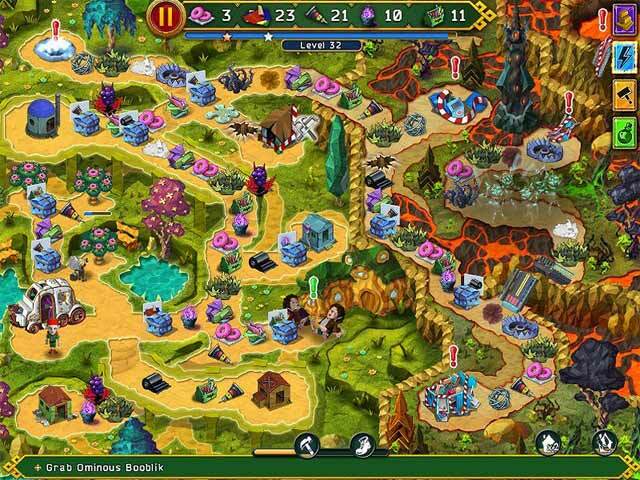 Try this game for yourself - it is games like this that the trial periods are for. I read reviews before I buy and am sorry to say I almost didn't try this one because of mentions of 'stupid plot' and 'poor graphics'. Having played the entire CE game plus the bonus levels, I think these reviews are mainly from folks who quit a few levels in and just aren't the right market. If you like to play GAMES (as in fun, smile, laugh) you will smile all the way through this one. Reviews say a lot about the reviewer, so here are my specs: I am a 50 year old physician who has worn glasses since 2d grade. I've played hundreds of BigFish games including the previous episodes of the Incredible Dracula series. 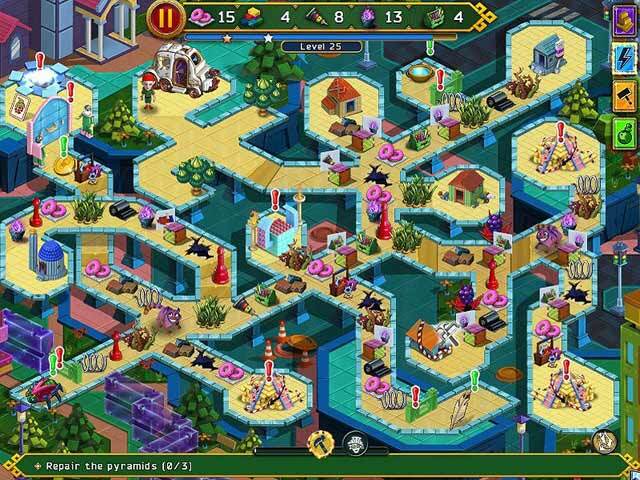 I play games to relax, so I like this type of builder time management game but not the hectic restaurant ones. I play with the sound off so cannot comment on music or voicing at all. I do feel qualified to evaluate 'stupid' and the plot is not 'stupid', it is lighthearted and entertaining in a similar way that the other Dracula plots are. The gaming world is full of evil occult graveyard games - I see enough grimness and death in real life, I don't find it entertaining, and the Dracula series is a welcome relief from that. Game of Gods is similar to most time management games in that a reason is found to send Dracula cleaning up or building through lots of levels-- there are only so many reasons to do that, so of course the reasoning is a little thin if you aren't willing to suspend reality. Compared to previous Draculas there are fewer plot/location shifts and more verbal banter between Loki and Dracula, including puns (if you don't like puns, probably stop here). There are lots of little visual winks in the scene backgrounds if you appreciate that sort of thing - like the Lego-like treetops in the 'plastic' levels and the rolling eyeballs of an agent. Like other episodes, different levels have characters with their own (silly) agendas scattered around that you have to help. I also feel qualified to comment on visibility. I'm having a harder time seeing the print of this review than I had seeing the level details in Game of Gods. Like other Draculas, the scenery is crisp, bright and colorful without attempt to look 'real' (no dark-on-dark items such as in grim HOGs, hooray!). There are some paths that run under or over others and it may take a close look to see where they run, but that is no different from the previous Draculas, and I like the complexity of overlapping paths which are not present in most other TM series. I liked the concept of origami landscape; though the scenery in those levels does look different than one is used to, I found it fresh, not confusing. Origami necessitates unusual building supplies such as paper, glue, and tape, though the mechanics of collect-enough-of-each are same as other TM games and prior Draculas. I buy the CE for the extra levels. In Dracula they are pretty much like the rest of the game, and enough of them that I felt I got my money's worth. There is a glitch in the collections display which makes it not work (this review is January 2018 so game is brand new, I imagine this will be patched soon) but that's a shrug for me, the fun for me is in looking not counting. This is a little easier than prior Draculas; I rarely had to repeat a level to get gold, though I've only played with multi-click option. The prior Draculas are (in my opinion) harder than most other building TM series, so this is a change. Glad they made it, glad I bought it, I think those who are looking for lighthearted fun will like it too. Rated 5 out of 5 by khendrick1 from Another great TM Game While this one isn't quite like the other Incredible Dracula games if you read the story before it starts you will understand why. The graphics are different based on the story line. They aren't bad. Dracula and his minions are the same they are just in a board game. I played the free trial and decided it was fun enough to purchase. I didn't really encounter any difficulty until level 10. I play the multi click version. The trick, like all TM games is knowing the order to do things. I loved it.